← Do snowstorms disprove global warming? The U.S. Government will fail to adequately address sustainability issues, and American citizens will have to abandon the top-down approach and rely on a bottom-up approach to solving these problems that affect our national security. I say this because Congress and the public have become so polarized along ideological lines that compromise and political progress have become impossible. As a result, moderate members of Congress are choosing to leave rather than run for reelection. On February 16, 2010 when moderate Evan Bayh (D-Ind.) announced that he would not seek reelection after two terms, he stated that "there is too much narrow ideology and not enough practical problem-solving" on Capitol Hill (Kellman and Jackson, AP, 2/17/2010). Nowhere was this more apparent than when the Senate in January rejected a bipartisan deficit commission that could have forced Congress to make painful budget decisions. Members of Congress are unable to agree to reduce capital outflows, but they refuse to increase capital inflows by raising taxes because that is politically unpopular. Most telling was the fact that some Republicans who originally supported the commission changed their votes after President Obama endorsed it. Clearly these members of Congress were acting in the interests of their political party rather than of the country they serve. By rejecting the establishment of a commission that could have taken the heat for such unpopular decisions, Congress essentially sealed the economic fate of the federal government. 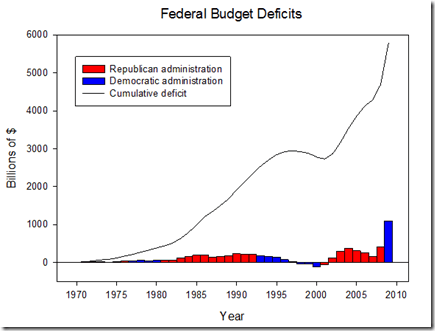 This plot shows the federal deficit over time. The total area under the annual deficit bars is a measure of the total deficit, i.e., the economic overshoot = outflows – inflows, which is also shown by the cumulative deficit line that is now approaching $6 trillion. The federal budget is seriously out of balance, but even worse, in most cases these deficits were planned. Unbalanced proposed budgets are passed every year now. In this plot I’ve shaded Republican administration years red and Democratic administration years blue. Notice that until Barack Obama took office in 2009 the red area was much greater than the blue area, meaning that until 2009 Republican administrations contributed more to the deficit than Democratic administrations. Of all of the Presidents since 1970 only Bill Clinton managed to balance the budget, ringing up surpluses in his last three years of office. In contrast, President George W. Bush changed the budget surplus of his first year in office, which was budgeted by Clinton, and turned it into record deficits within two years. As a result of the economic recession in President Obama’s first year in office in 2009 the annual federal budget deficit rose to the highest level ever. It remains to be seen if the benefits of the money spent on the economic stimulus package to stave off the recession outweigh the harms resulting from the increase of the deficit, but if the trend continues, the federal government will soon be unable to meet its financial obligations, and this will likely result in an economic collapse. Most economists predict that interest payments on the budget deficit will consume 80% of all federal revenues by 2020 (Tom Raum, AP, 2/15/2010). And it will only get worse. In January the U.S. Supreme Court, dominated by political ideologues, voted to eliminate any limits to political contributions by corporations or lobbies. Most American citizens believe that members of Congress are already in the pockets of corporations. Now these corporations will have unlimited influence. The fate of bills will be decided by who has the deepest pockets. And when it comes to the three ABCs of unsustainability, who do you think will win when Congress tries to regulate Automobile, Beef, and Coal producers? Will members of the Senate ever vote to limit CO2 emissions when wealthy oil companies are paying them not to? Congress is losing its integrity and its independence. Soon it will lose its economic power and therefore its influence. We can’t rely on Congress to fix our problems. This entry was posted in Current events, Economics, Politics, Science, Sustainability. Bookmark the permalink.